More likely to be heard than seen in the dense vegetation of overgrown fields, second-growth woodlands, river bottoms and forests, cuckoos move slowly as they forage for caterpillars, other large insects and small frogs. The Yellow-Billed Cuckoo is a medium-sized bird, about the size of a Blue Jay or Mourning Dive, with a long, dark, white-tipped tail. It is brown above and white below, with a down-curved bill that is yellowish underneath. The Black-Billed Cuckoo has, of course, a completely black bill, but can also be distinguished by its red eye-ring, and the narrow white bars on its tail, where the Yellow-Billed bird has longer, larger white spots. The Yellow-Billed bird has a loud harsher "ka-ka- cow-cow" call, while the Black-Billed Cuckoo's song is a more melodic coo-cooing, like the name. Both members of a pair work to make the nest out of twigs in a tree or bush, to incubate the bluish-green eggs, which are usually laid in their own nest, and to raise the rapidly-developing young. 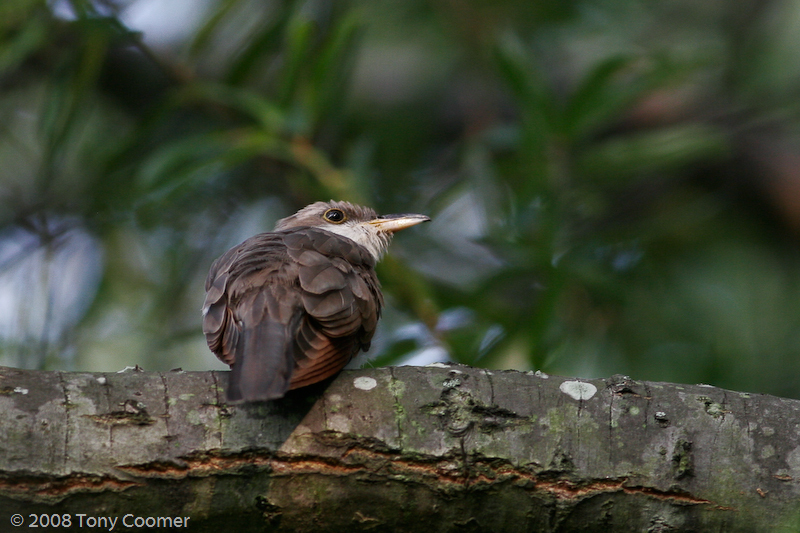 Nevertheless, like other cuckoos worldwide, this bird does sometimes lay eggs in nests of other species, including those of robins, cardinals and catbirds (and the Black-Billed Cuckoo!). Thus, unlike the "brood parasitism" of other birds, this activity of this native Cuckoo generally does not affect the population of rarer, already-threatened species.